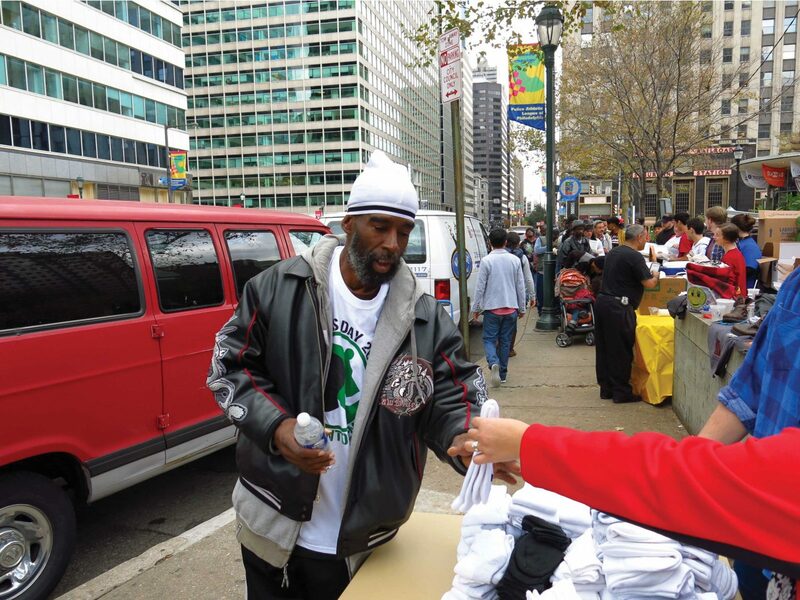 Giving new socks to the homeless in Philly next to Love Park. It’s make you feel good inside when you get a “Thank you and bless you” after you hand a new pair of socks to a homeless person. It’s also make you feel good when you see how the student volunteers from Arcadia University reacted to the experience of handing out over 550 pair of new socks. They said they felt special in being able to help with something as basic as a pair of new socks. In addition to handling out socks, volunteers also provided food, toiletries and clothing. The event, in its second year, was sponsored by S.P.E.A.K. (Staying Positive Equals Amazing Kids) and coordinated by Cruz Rivera from Arcadia University. To find out more about S.P.E.A.K. and their good work please click here to visit their website. Thanks to Cruz and the other sponsors for letting us help make homeless toes healthy and happy toes!